‘Resistance to the death’- a tribe’s intentions to commit mass-suicide on one side of Brazil while concerns on the other side remain with soap operas and the incoming Olympic Games. 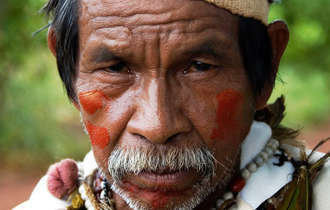 On 8th October 2012, elders from a community of Guarani-Kaiowá indigenous people wrote a letter to the Brazilian Government, announcing their unanimous intention to commit mass suicide together (50 men, 50 women, and 70 children), if the Brazilian Federal Court didn’t revoke its decision to move them from their sacred ancestral lands near the Hovy River in the Iguatemi region of Mato Grosso do Sul state, in the interior of the country. In their letter, the elders ask for the government to “decree our decimation and total extinction”, and send tractors to dig a mass grave, so that their bones can be buried in the same earth as those of their ancestors. After decades of struggle for the rights to their own lands, the community has finally resolved itself to the futility of their attempts, and decided to opt for a dignified death, together, just as they have tried to live for all these years. Since the beginning of the 20th century, the Guarani-Kaiowá ethnic group (the 2nd largest indigenous group in Brazil, numbering about 43,000 people) has forcibly been removed from its ancestral lands. In what has since been called the ‘Great March West’, white settlers headed inland throughout the 20th century, confining the ‘Indians’ to reserves in the process, while ranchers seized the lands to profit from the natural resources they found there. 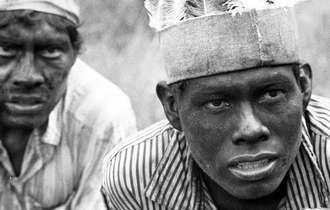 Migration increased even more during the Military Dictatorship in the ‘60s and ‘70s, and the indigenous peoples found themselves facing 3 effective options: to disappear yet deeper into the forest; to stay confined within the decreed reserves; or to submit to hard manual labour in conditions of semi-slavery on the new ranches. Even the supposed new democracy founded in the Constitution in 1988, which stated that indigenous lands should be demarcated within 5 years, has not done much to aid the situation- the process quickly became very sensitive to pressure from the landowners, settlers, ranchers, and agribusinesses now dominating the territory, leading to the ‘Indigenous Problem’ being shunted ever further down the list of priorities. 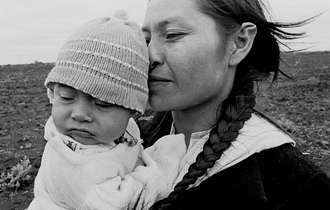 Unable to live according to their own cultural, social and historical values, the indigenous were contained in small reserves, and swathes of them turned to alcoholism as a way out. Camps are rife with malnutrition, especially in children, and homicide rates within the reserves (which house various communities together) are greater even than rates found in war states. A report by the Indigenous Missionary Council (CIMI) using data from 2003-2010 revealed a murder rate in the main indigenous reserve of Dourados 495% higher than averages in the rest of the country. Every 6 days, a young Guarani-Kaiowá commits suicide: government figures reveal 555 suicides since 2000, 98% of them hanging themselves from low trees; the majority were young men aged between 15-29 years of age. Most of the rest either beg, or labour in the sugar cane fields. So far, more than 20 of the tribal leaders who have denounced the treatment of their peoples have been assassinated, most probably by private militia of thugs organised by the ranchers. In 2011, a small group of men, women, and children left the central reserve in search of their traditional ancestral lands, and eventually camped near to the site, alongside the river. They were soon surrounded by hired gunmen, who have held them confined ever since. In the past year, these gunmen have shot down the group’s makeshift bridge (over the 30m wide and 3m deep river) ten times. Already 4 of this group have died; 2 committed suicide, the other 2 were beaten and tortured by the gunmen. Since their arrival at this makeshift camp in the hope of regaining the lands where their ancestors are buried (the Pyelito Kue/Mbarakay area), the group have received no aid, and have only had the means to eat once per day. It is this group of people who have now written to the government, requesting merely their right to die and be buried alongside their ancestors. Despite decades of struggle, successive governments and alternations of power since the 1980s have meant that the situation has never been properly addressed; each President leaving the ‘Indigenous Problem’ to be inherited by his successor, with no real plans to resolve the issue. The ethnic group have also written to the current President Dilma Rousseff , requesting their rights according to Brazilian and International law. Their more recent letter (from October 2012) further condemns the genocide, or cultural and historical extermination of one of Brazil’s largest ethnic indigenous groups. In their letter, they argue that they have no other recourse than suicide; the very Justice system to which they would go with their grievances is the system condemning them to be confined to reserves, where fear of violence, hunger and illness leaves hopes for a peaceful life fading rapidly on the horizon. Part of this huge problem is that while Brazil is, supposedly, a multifaceted, multicultural and all-inclusive nation, the more sidelined groups of society are not well represented in the higher legal, educational and federal echelons of society. With little or no integral part in the country’s legal and justice system, it is perhaps unsurprising that the voice of a small group of people hidden away in the forest is given much of a hearing. In the meantime, Brazil’s largest media corporations have not awarded the subject much attention either; the top recent news stories have tended to focus instead upon the end of a popular run of soap opera episodes. It goes unmentioned that Rede Globo- one of Brazil’s biggest media groups- also owns large portions of land across the country. Throughout the 20th century, in Brazil and across the world, indigenous communities have struggled to find their voice amidst the ongoing sidelining of ‘Indians’ as a ‘backward Other’ and the romanticisation of ‘simple’ peoples to be pointed at and photographed from afar. Most of us remain ignorant of their languages, world perspectives, and wealth of knowledge; even in Brazil, where their influence upon ‘Brazilian’ culture has been far greater than in the United States for example. With the approach of the 2016 Olympic Games, the world’s gaze will fall upon Brazil more and more frequently, but perhaps it’s time we started to ask ourselves just which Brazil we’re looking at. There is so much more to this nation that samba, football and sunshine. It is tragically ironic that the sidelined and too-often silenced Guarani-Kaiowá culture prizes speech as the most sublime aspect of the human being. Words are central to all aspects of life, accompanied by rituals celebrating their power. This is a community that believes that “the word is the core of resistance. It has an action in the world- it is words that act. They make things happen, they are the future”. This could be the last word from a people who have taken these words, and made a declaration of death their final action. Tags: brazil, guarani, human-rights, tribe. Bookmark the permalink.